This is the formula I need for personal gain from the time I lost working part-time retail. So, it's official: according to Facebook, by last week, it has been exactly a year since I posted a message about leaving my second (and hopefully my last) part-time retail job at Staples, where I worked for up to six months right after my first job at Stop & Shop, where I worked for a little over two years. Suffice it to say, I have had enough with retail at that point (at any place other than my dream store Barnes & Noble) among other reasons. I have been out of work since then for a whole year! Now, don't take that last statement as one of pure excitement from being out of a job for a whole year, which was not my original plan, mind you. Over time, it has proven to be a double-edged sword for me personally. At the time when I quit Staples, it was mostly because I didn't have to do any more mundane tasks that working retail (and customer service) required me to do, which all grew to be more tiring and grueling to me. Though I knew I wasn't going to be there forever, I still felt empty and unsatisfied and needed to get out. That was the same feeling I had while working at Stop & Shop, but at that time, I used the opportunity to work at Staples as my excuse to bolt out of there, thinking that it might get me closer to my chance to work at Barnes & Noble (just across the street) and would somehow get better, since I would mainly be working with office supplies and not with food. However, it only proved to be more of the same. This time around, my excuse for quitting Staples was that it gave me the opportunity to devote more time to my studies and my family. Although I partially benefitted from this reasoning, I still felt restless with myself and hopeless in my job search that didn't involve retail. While I thought that an internship at a major publishing company would have been great for an English major like me, and to get some cash rolling in after months of coming up nothing, because of frantic prepping for final papers, I missed out on the early deadlines for those internships. And like hell I'm going back to retail. So, that left last summer completely wide open, void of any work, which just a few years earlier would have been awesome for me, but the constant reminders from my family (as well as deep down inside) to get out and work as an adult would do kept looming over me and sucking most of any joy that I tried to get out of it. While I did apply (again) to Barnes & Noble and actually got an interview at the end of that summer, I was turned down for someone else, someone with 10 years of retail experience, a fraction of which I had and for which I mostly suffered. After all this time, I realized that while it was nice not stressing about how my work schedule won't conflict with my school schedule and all the personal time in-between, as well as the menial tasks that didn't do me any personal service won't conflict with my schoolwork, I still needed to keep myself busy but with a job/internship that I actually enjoy and to which I can give my all. This is the formula I need to gain back all the life I lost working part-time retail. So, now it's exactly a year since I quit my last job (and got my last paycheck) and this time, I will be taking advantage of the opportunity that presented itself to me: I went along with SBU's Career Center team to an on-site event at Penguin Random House, where I learned about the different jobs within the publishing business as well as the different deadlines for the different internship programs offered there. I couldn't be more psyched for a working position that couldn't be more perfect for me! My state of unemployment and restlessness will soon be over! This long job journey of mine has been a bumpy one, but my perfect fit job is just around the corner and this time, I am not afraid to wear my heart on my sleeve to get it. Though there are definitely some things I would've liked to have done differently, while it did take me a long time to reach this point, I needed at least some time to reflect on what I did wrong in my past jobs, as well as my breaks in-between and afterward, so that I'll be more careful with myself next time. A conversation with Ellena Whitfield on the future of YouTube, journalism, and social media. Ellena Whitfield, popularly known as "EllenaWhat" has taken advantage of the social media revolution with the success of her YouTube channel, which has a following of 65,000 subscribers. YouTube has become the gateway to success for many young internet influencers as the site became second-most popular in the world as of August 2018. Whitfield has applied her success online to her schooling at the Walter Cronkite School of Journalism and Mass Communication at Arizona State University. With an aspiration to become a Rolling Stone or Alternative Press journalist, Whitfield creates weekly music reviews to her channel. "I think YouTube is relevant because of the culture our generation expresses. We grew up with the boom of social media and it's our modern-day entertainment on a more personal level. Our parents experienced the same thing through the boom of television. This is why we've started to idolize influencers like they are movie stars," Whitfield said. Whitfield has met many other young and successful influencers during her time at ASU and the making of her channel. Her cousin, Kendall Rae, a YouTuber with 1 million subscribers inspired her to create her channel. Whitfield expressed that she would love to become a full-time YouTuber, but there is always the fear that the platform will crash. "One of the biggest YouTube influencers, Jeffree Star, was making money off of Myspace and then all of a sudden the platform, which seemed revolutionary at the time, crashed and he was forced to live on his friend's couches for a while," Whitfield said. Even with the fear of YouTube ending, Whitfield said her YouTube channel has given her a platform and the experience she needs to succeed as a journalist. Whitfield said that YouTube not only helped her gain a social relevance, but it gave her experience on how to make relevant and timely content. Human communication professor, Steven Corman emphasizes Whitfield's point on the importance of present-day journalists adopting the social revolution. "Mainstream media and social media are part of a shared ecosystem. Mainstream media uses social media as a source of information, and social media plays an important role in distributing stories from mainstream media. Journalists need to embrace both if they want to be successful in creating stories and reaching larger audiences with those stories," Corman said. The most unique aspect of journalism is that it is forever expanding. There are many new platforms and ways of sharing news such as YouTube that allows journalists to spread news faster than ever. 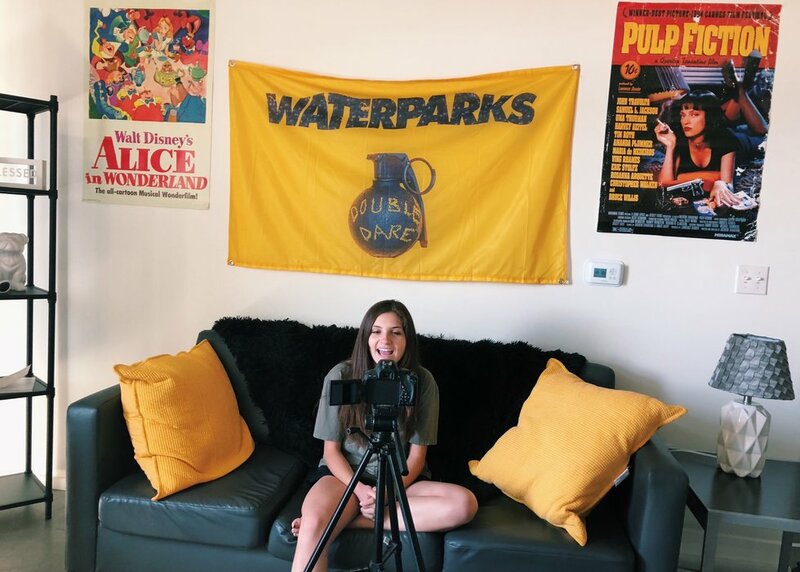 Lexi Varrato, the social media director of ASU's AWSM club strives to evolve with journalism, especially when it comes to the club she helps run as it is one of the most important aspects of journalism to stay relevant. "Having a social platform as a journalist is crucial because it helps you build your brand and create a presence in an era that is so technologically focused. Not only will you create your image, but it allows you to make connections that will help you further your career," Varrato said. The rise of young influencers is very inspiring to Whitfield as she says it is realistic to make a career as an influencer. She said that YouTube can lead creators to many different careers such as creating a fashion line or becoming a journalist as she aspires. Whitfield plans to keep her channel as long as YouTube exists because she loves every aspect of documenting her life and sharing it with her audience. Whitfield expressed that she cannot wait to see where YouTube is in a couple years and believes many college students should give YouTube a try. "People that have millions of subscribers all started with zero. If you don't start now you're never going to know what could happen," Whitfield said.